A new update on the U.S. Transportation Security Administration (TSA) website announces and provides information about a new Helpline called “TSA Cares” that will be provided by the TSA to assist travelers with disabilities and medical conditions. The hours of operation for the TSA Cares helpline are Monday through Friday 8 a.m. – 11 p.m. EST and weekends and Holidays 9 a.m. – 8 p.m. EST. TSA recommends that passengers call 72 hours ahead of travel to for information about what to expect during screening. “When a passenger with a disability or medical condition calls TSA Cares, a representative will provide assistance, either with information about screening that is relevant to the passenger’s specific disability or medical condition, or the passenger may be referred to disability experts at TSA,” the agency says. “TSA recommends that passengers call approximately 72 hours ahead of travel so that TSA Cares has the opportunity to coordinate checkpoint support with a TSA Customer Service Manager located at the airport when necessary,” the TSA site states. “Our current policies and procedures focus on ensuring that all passengers, regardless of their personal situations and needs, are treated equally and with the dignity, respect, and courtesy they deserve,” TSA’s site states. 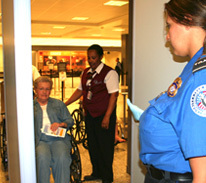 See the TSA Website for multiple links to additional information specific to particular disabilities, medical needs, and issues regarding traveling with assistive technology. See also the MedlinePlus website on Assistive Devices (also called Assistive Technology). MedlinePlus is a website providing consumer health information that is a service of the U.S. National Library of Medicine, National Institutes of Health.